"Confederates, help your brothers in need!" 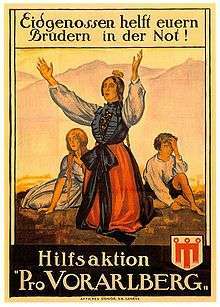 Swiss poster of the Pro Vorarlberg movement advocating for an accession of Vorarlberg, 1919. The enlargement of Switzerland by way of the admission of new cantons to the Swiss Confederation ended in 1815, and the territory of Switzerland was fixed (with the exception of minor border corrections) by 1863. After the end of the First World War, there was a campaign in Vorarlberg to join Switzerland. 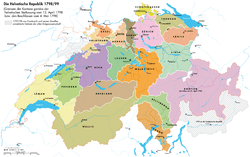 In a 1919 referendum, 81% of the people of Vorarlberg voted to join Switzerland, but the campaign failed both because Switzerland was reluctant to support it and because it was opposed by the Allies, and Vorarlberg was instead incorporated into the First Austrian Republic. There was a brief and unsuccessful revival of Alemannic separatism after World War II, and in the later half of the 20th century, there were no serious political scenarios of any further enlargement of Switzerland. Since 2008, such proposals have become frequent as expressions of Euroscepticism, reflecting the wish of territories within European Union member states to leave the European Union in view of the ongoing European debt crisis. Since there is currently no legal framework governing the admission of new cantons, any enlargement would, as a matter of Swiss law, require an amendment of the Swiss federal constitution and therefore a national popular referendum. A corresponding proposal was submitted by Jurassian representative Dominique Baettig in 2010, but was dropped after Baettig was not reelected in 2011. Map of the territorial evolution of the Old Swiss Confederacy. 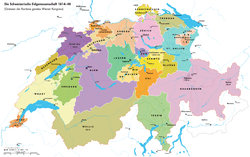 For a list of Swiss cantons by year of accession, see Cantons of Switzerland. 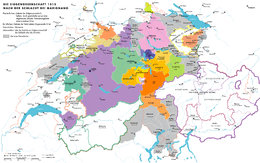 Switzerland, a multilingual federation of 26 cantons whose origins lie in a defensive alliance of alpine valleys around the end of the 13th century, grew through the accession of new states and territories during the 14th to 16th centuries. The accession of Appenzell in 1513 completed the growth of the Confederacy into the Thirteen Cantons of the early modern period. The Valais became an "eternal associate" of the Confederacy in 1529. 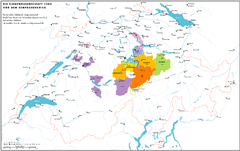 In 1536 the Swiss canton of Berne annexed the Vaud from Savoy. Geneva had sought alliances with the Swiss Confederacy (in order to defend itself against Savoy) since the early 16th century. The conclusion of an eternal treaty with the Protestant cantons Berne and Zürich in 1584 tied Geneva closely to Switzerland, but the Catholic cantons, which had allied themselves with the dukes of Savoy since 1560, opposed the full accession of Geneva as a member of the Confederacy. 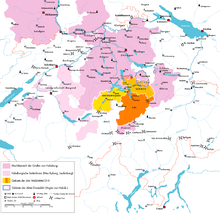 In addition to the cantons, the Old Swiss Confederacy had several associated states (Zugewandte Orte), which included the Sieben Zenden (Valais), the Three Leagues (principally present-day Graubünden), and the Imperial Abbey of St. Gall. New cantons were added only in the modern period, during 1803–1815; this mostly concerned former subject territories now recognized as full cantons (such as Vaud, Ticino and Aargau), and the full integration of territories that had been more loosely allied to the Confederacy (such as Geneva, Valais and Grisons). Grisons acceded with the Act of Mediation in 1803. At that time, the territory of Tarasp, formerly an exclave within the territory of the League of God's House, was ceded by Austria. Similarly, the newly created canton of Aargau included the territory of Fricktal, which had previously remained as the only territory left of the Rhine under direct Habsburg control. The Canton of St. Gallen was created at the same time, out of a number of disparate territories, which had however all been previously either allied with or subject to Swiss cantons. The territory of Geneva was fragmented, with various enclaves or exclaves of Savoyard and French territory, and it was not connected to Swiss territory. Due to the efforts of Charles Pictet de Rochemont, the Congress of Vienna decided to incorporate seven communes of the French Pays de Gex in order to create a land bridge between Geneva and Switzerland. The Valtellina had been a territory of the Three Leagues from the 15th century until 1797, when it was annexed by the Cisalpine Republic. The Congress of Vienna considered restoring the Valtellina to Grisons, and thus to Switzerland, but the strategic importance of the territory was deemed as too high by Austria, and it became part of the Kingdom of Lombardy–Venetia instead. The loss of the Valtellina remained an irredentist issue in Grisons well into the 20th century. Along with the Valtellina, Chiavenna was lost to the Cisalpine Republic in 1797, and the Congress of Vienna likewise declined its restoration to Switzerland. While Switzerland accepted the loss of Chiavenna itself, the Valle di Lei north of Chiavenna was indicated as Swiss territory on the Dufour map of 1858. It was only in 1863 that Switzerland reached an understanding with the Kingdom of Italy on the exact definition of the Swiss-Italian border. The Congress of Vienna distributed the remaining territory of the Prince-Bishopric of Basel (intermittently annexed by France) to Berne and Basel. The commune of Le Cerneux-Péquignot had been part the Franche-Comté and as such of the kingdom of France since 1678. It was to be ceded to Neuchâtel according to the treaty of Paris of 30 May 1814, but the necessary border correction did not become official until 1 February 1819. Switzerland in 1815 was still a confederacy, not a fully integrated federation. The canton of Neuchâtel joined in 1815 as a member of the confederacy but was at the same time a monarchy, its sovereign being Frederick William IV of Prussia. This made it impossible to integrate Neuchâtel into the federation created in 1848, and Neuchâtel acceded as a full canton only in 1857, after Frederick William renounced his claims on the area. A number of territorial disputes remained along the German-Swiss border, especially concerning the territories of Thurgau and Schaffhausen. The status of Tägermoos was settled in 1831, the precise borders of Schaffhausen in 1839, and the final remaining questions by 1854. When Ticino chose to become part of the Swiss Confederation in 1798, the people of the Italian exclave Campione d'Italia chose to remain part of Lombardy. In 1800, Ticino proposed exchanging Indemini for Campione. In 1814 a referendum was held, but the residents of Campione were against it. In 1848, during the wars of Italian unification, Campione petitioned Switzerland for annexation, but this was rejected due to the Swiss desire to maintain neutrality. After Italian unification in 1861, all land west of Lake Lugano and half of the lake were given to Switzerland so that Swiss trade and transport would not have to pass through Italy. The d'Italia was added to the name of Campione in the 1930s by Prime Minister Benito Mussolini and an ornamental gate to the city was built, both in an attempt to assert the exclave's Italian-ness. 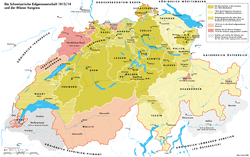 Since 1857, there have been no more territorial accessions to Switzerland (although a new canton gained accession in 1979 as the canton of Jura, its territory seceding from Berne). There have, however, been a number of unsuccessful proposals for territorial enlargements of Switzerland. The part of the Chablais region south of Lake Geneva was ceded to the Kingdom of Sardinia by the Congress of Vienna, but declared a demilitarized zone, and Switzerland was granted the right to occupy both Chablais and Faucigny for its own protection in the case of war. In 1860, when France annexed Savoy from the Kingdom of Piedmont-Sardinia, Napoleon III declared his intention to cede Chablais and Faucigny to Switzerland, but later reneged on the promise. The Swiss authorities were themselves ambivalent on the matter, as they feared the destabilising effect the annexation of two Catholic provinces might have on interfaith relations within the country. But popular opinion in Switzerland was outraged at Napoleon's breach of promise. Switzerland increased its military presence at the southern border to prevent clashes between Savoyard and Swiss irregulars. The crisis subsided gradually as it became clear that Napoleon adhered to the promise of neutrality for Haute-Savoie renewed in the Treaty of Turin of 24 March 1860. But Switzerland did not recognize the annexation of Savoy, and the status of Chablais was brought before the Permanent Court of International Justice several times between 1922 and 1932. In 1918 after the First World War, a referendum was held in Büsingen in which 96% of voters chose to become part of Switzerland. However, it never happened as Switzerland could not offer anything suitable in exchange, and consequently Büsingen has remained an exclave of Germany ever since. Later attempts were rejected by Switzerland. The exclave of Büsingen was formally defined in 1967 through negotiations between West Germany and Switzerland. At the same time, the West German exclave of Verenahof, consisting of just three houses and fewer than a dozen people, became part of Switzerland. In a 1919 referendum, 81% of the people of Vorarlberg voted to join Switzerland, but the effort failed because of the ambivalent position of the Swiss government and the opposition of the Allied powers. The Swiss government expressed willingness to consider the accession of Vorarlberg to Switzerland, mostly in order to prevent its incorporation into Germany. Since the formation of Baden-Württemberg in 1952, there had been no longer any serious political scenarios of South German territories seceding to Switzerland. The idea was revived, at least in popular discourse, in the context of growing Euroscepticism since the late 2000s. A poll by ORF radio in October 2008 reported that about half of the population of Vorarlberg would be in favour of joining Switzerland. In the Swiss parliament, a 2010 motion was submitted by Jurassian representative Dominique Baettig and co-signed by Swiss People's Party (SVP) party chairman Toni Brunner. The motion proposed to offer territories adjacient to Switzerland the "Swiss model of sovereignty" as an alternative to a "creeping accession" of Switzerland to the "centralist" European Union (EU). As possible candidates for accession, the motion named Alsace (FR), Aosta (IT), Bolzano (IT), Jura (FR), Vorarlberg (AT), Ain (FR), Savoie (FR), Baden-Württemberg (DE), Varese (IT), Como (IT) "and others". In Como, an online poll in June 2010 by the La Provincia di Como newspaper found 74% of 2,500 respondents in favor of accession to Switzerland, which the local regionalist party Lega Lombarda has long been advocating. Another online poll by the South German Südkurier newspaper found that almost 70% of respondents replied "yes, the Swiss are closer to us in outlook" to a question whether the state of Baden-Württemberg should join Switzerland. The paper noted that seldom had a topic generated so much activity by its readership. The Lombard eco-nationalist party Domà Nunch replied to Baettig's motion proposing an integration between Switzerland and the Italian border-area of Insubria in order to join into a new Confederation. In Sardinia, the Associazione no-profit Sardegna Canton Marittimo was formed in April 2014 with the aim of advocating Sardinia's secession from Italy and becoming a "maritime canton" of Switzerland. Die Welt in June 2014 based on an OECD study published an article arguing that Southern Germany is more similar to Switzerland than to Northern or Eastern Germany. In the wake of the article, there were once again reports on high levels of support for accession to Switzerland in Southern Germany. Schwäbische Zeitung reported 86% of participants in an online survey expressing approval. Also in 2014, there were reports of a popular movement in South Tyrol to join Switzerland. The 6th "Global Forum Südtirol" held in Bolzano was dedicated to the question. Switzerland in 1315, just before the Battle of Morgarten. Switzerland in 1385, just before the Battle of Sempach. Switzerland in 1474, just before the Burgundian Wars. Switzerland in 1515, just before the Battle of Marignano. Switzerland in 1536, during the Reformation, just after the conquest of Vaud by Bern and Fribourg. Switzerland in the 18th century. Another map of Switzerland in the 18th Century. Provisional constitution of the Helvetic Republic, 15 January 1798. Constitution of the Helvetic Republic, 12 April 1798. Helvetic Republic, with borders as at the Second Helvetic constitution of 25 May 1802. Switzerland after Act of Mediation, during Napoleonic Era, until 1815. Reorganization and enlargement of Switzerland during the Congress of Vienna in 1814. Switzerland during the Restoration, 1815-1847. ↑ Collex-Bossy, Genthod, Le Grand-Saconnex, Meyrin, Pregny, Vernier, Versoix, with a total area of 49.3 km2 (19 sq mi) and a population of 3,343 at the time. Antoine Morin: Précis de l’histoire politique de la Suisse. Paris, 1856. T. 2, Pièces justificatives, No 15, 423–425. cited after Salamin, Documents d’Histoire suisse (1969), 69–70. ↑ resolved in the Convenzione tra l'Italia e la Svizzera per l'accertamento della frontiera fra la Lombardia ed il Cantone dei Grigioni of 1863 (original text at admin.ch). Other Swiss-Italian treaties regarding the course of the border date to 1873/4 (BS 11 83, SR 0.132.454.1), 1936/7 (SR 0.132.454.1 / AS 1969 1308) and 1941 (0.132.454.2, Abkommen zwischen der Schweizerischen Eidgenossenschaft und dem Königreich Italien über die Festlegung der italienisch-schweizerischen Grenze auf der Strecke zwischen Run Do oder Cima Garibaldi und Mont Dolent, 24 July 1941), with an additional exchange of about half a square kilometer of territory for the construction of the Lago di Lei barrage in 1955, "Convenzione tra la Confederazione Svizzera e la Repubblica Italiana concernente una modificazione di confine nella Valle di Lei" (PDF) (in Italian). ↑ Josef Inauen, Brennpunkt Schweiz: die süddeutschen Staaten Baden, Württemberg und Bayern und die Eidgenossenschaft 1815-1840, Saint-Paul (2008), p. 208. ↑ Jacobs, Frank (15 May 2012). "Enclave-Hunting in Switzerland". New York Times. Retrieved 19 May 2012. ↑ Wilhelm Oechsli (2013-06-13). History of Switzerland 1499-1914. Cambridge University Press. p. 404. ISBN 978-1-107-62933-2. ↑ Clive H. Church; Randolph C. Head; Randolph Conrad Head (2013-05-23). A Concise History of Switzerland. Cambridge University Press. p. 169. ISBN 978-0-521-19444-0. ↑ Jean-Jacques Bouquet: Chablais in German, French and Italian in the online Historical Dictionary of Switzerland. ↑ Low, Alfred D. (1974). The Anschluss movement, 1918-1919, and the Paris Peace Conference. American Philosophical Society. pp. 350 et seq. ISBN 978-0-87169-103-3. "As far as Switzerland was concerned, she only considered Vorarlberg's Anschluss with herself, because the alternative, an Anschluss with Germany, seemed to constitute a clear theat to her." ↑ "Jeder zweite Vorarlberger wäre lieber Schweizer". 20 Minuten. 23 October 2008. 1 2 3 Erleichterte Integration grenznaher Regionen als neue Schweizer Kantone, motion 10.3215 of 18 March 2010 by Dominique Baettig. ↑ Renz, Fabian (11 June 2010). "SVP will der Schweiz Nachbargebiete einverleiben". Tages-Anzeiger. Retrieved 22 June 2010. ↑ Maurisse, Marie (22 June 2010). "Quand un député suisse rêve d'annexer la Savoie". Le Figaro. Retrieved 22 June 2010. ↑ "SVP-Forderung: Vorarlberg soll Kanton werden". Der Standard. 21 June 2010. Retrieved 22 June 2010. 1 2 Coen, Leonardo (22 June 2010). "L'ultima tentazione di Como: "Vogliamo diventare svizzeri"". La Repubblica. Retrieved 22 June 2010. ↑ "Nichts wie weg von den Pleitegeiern". Tages-Anzeiger. 22 June 2010. Retrieved 22 June 2010. 1 2 "Schweizer Idee sorgt für viel Wirbel". Südkurier. 19 June 2010. Retrieved 22 June 2010. ↑ "Domà Nunch rilancia: lavoriamo insieme per una confederazione elvetico-insubre". Retrieved 29 June 2010. ↑ Chiara Albanese and John Letzing, In Sardinia, Secessionists Want to Leave Italy and Join... Switzerland? Mediterranean island would give Alpine nation access to the sea, supporters say; ‘a natural match’, Wall Street Journal, 2 June 2015. ↑ "Italy: Campaign to sell Sardinia to Switzerland", BBC News, 28 February 2014. ↑ Yannick Dillinger, 86 Prozent der Leser wollen Schweizer werden, Schwäbische Zeitung, 4 July 2014. ↑ Nicolas Saameli, Das Südtirol will Schweizer Kanton werden, 20 Minuten, 28 July 2014.